‘Watch out: the vegetarians are on the attack’ warned an article published in the April 1984 edition of the Meat Trades Journal. The threat? A new product that would revolutionise the UK’s eating habits forever. Gregory Sams’s VegeBurger invented a vernacular that is so ubiquitous now, you probably thought it’s always been here. While vegetarianism can be traced way back to 7th century BCE, ‘Veggie’, as in the food products and the people that consume them, dates back to the early 1980s. VegeBurger was the first vegetarian food product to become available on a mass, affordable scale. It was sold in supermarkets rather than niche wholefood shops, and helped popularise the notion that a vegetarian diet was possible. Before inventing the VegeBurger, Sams opened Seed in 1967, London’s first macrobiotic whole food restaurant. 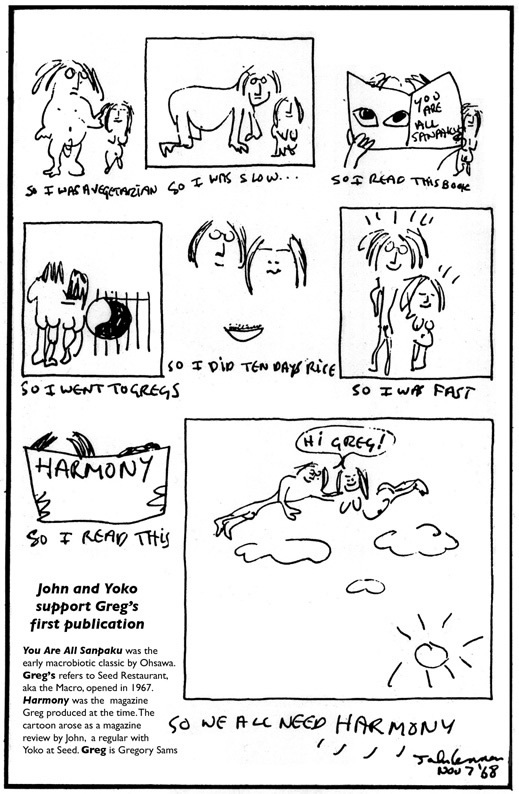 Seed was regularly frequented by all the countercultural luminaries of the era, including John and Yoko. Working with his brother Craig Sams he started Harmony Foods, a whole food distribution business (later Whole Earth), and published the pioneering Seed – the Journal of Organic Living. In 1982 Gregory went out on a limb to launch the VegeBurger. Colleagues in the whole food business (and the bank manager) expressed concern about how successful a single-product business could be. VegeBurger defied the doubters, however, and sales rocketed to 250,000 burgers per week as the 80s wore on. The burgers may have sold well, but they also helped change hearts and minds. In 1983 his company Realeat commissioned Gallup to conduct a survey of public attitudes to meat consumption. The survey results coincided with the release of the frozen VegeBurger, prompting substantial debate in the media about vegetarianism. ‘It was news, with more people moving away from red meat consumption than anybody had realized. VegeBurger was on television, radio and newspapers to such a degree that, when I wasn’t being interviewed or responding to a press query, all my time was spent keeping retailers stocked with the new hit’. Great Bear have just transferred the 1982 VegeBurger TV commercial that was recorded on the 1″ type C video format. Gregory’s story shows that it is possible to combine canny entrepreneurship and social activism. Want to know more about it? You can read the full VegeBurger story on Gregory’s website. Thanks to Gregory for permission to reproduce the advert and for talking to us about his life. You are currently browsing the greatbear analogue and digital media blog archives for January, 2017.